Covermount Gift with Purchase promotions are a major sales strategy to sell more magazines. 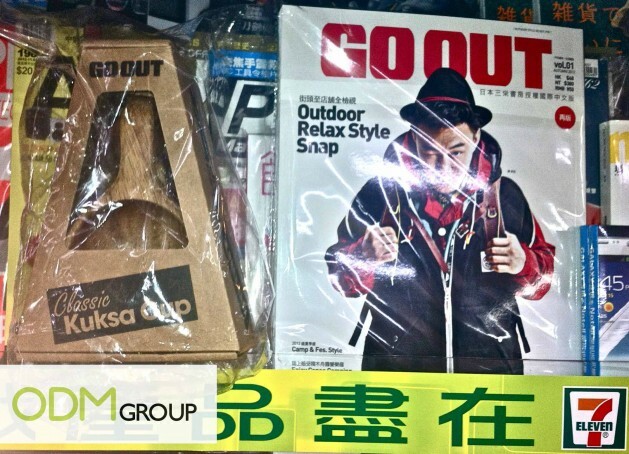 Let’s discuss the subject using the example of a recent promotion by Go Out Magazine in Hong Kong, selling at 7-Eleven stores across the city. ODM are a great fan of these covermount gift promotions which fill magazine shelves around the world. The on-pack promotional products, which are advertising the magazines, are for the most part eye catching and attractive. 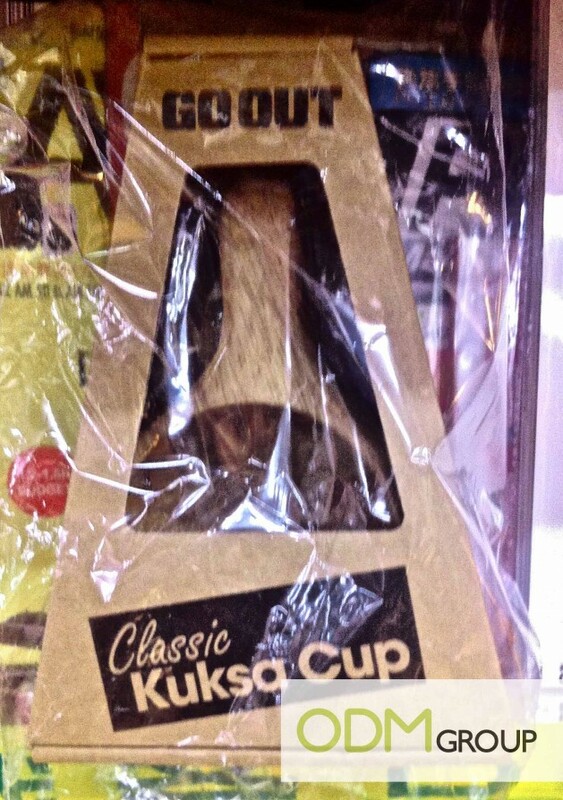 Covermount Gifts – who wants a Kuksa Cup? Kuksa Cups are a traditional Finnish Birch wood serving cup. This is a traditional drinking cup of the Sami tribe, indigenous to North Scandinavia. These cups act as the ultimate camping mug, and are equally good at home. This is why such a cup would make for an excellent covermount gift, an on pack for an outdoors magazine. Just remember to rinse the cup with cold water after use. These are light, bounce if dropped, and have better insulating properties than porcelain or enamel. Of course this stops them freezing to lips during freezing winters, but it is hardly a problem in Hong Kong. How is a Covermount Gift usually used? For Covermount Gifts, the usual method of packaging is to place the on pack in a transparent plastic sleeve. It is then mounted on the cover of the magazine with adhesive tape or glue, hence the name. Covermount gifts work well by boosting sales in the short-term. Here are some key issues to consider when deciding if this is the right strategy for you. Covermount Gift cost: It is important to understand the financials behind using a covermount gift. Is your company’s marketing budget sufficient to use such covermount gifts? Impulse purchase factors: Would the gift increase the odds of customers making impulse purchases. If the gift does not compel customers to purchase your product, it would end up being a waste of resources. Added value/product feature: When using such gifts, it is essential that the gift adds value to a customer’s purchase. Therefore, you must assess if the gift that you plan to use resonates with the customer. Covermount fatigue if this marketing channel overused: It is important to study the market, and your competitors. This would help to see how widely this marketing tool is used. Customers will shy away from your products if this marketing tool is overused, making it counterproductive. Cost Benefit Analysis – Circulation, Cost & Sales Growth: Before using a covermount gift, it is vital to examine the cost benefits, and weigh it against the cost of using the gift. Advertiser issues – does it tie in with their values: It is important to take note if the gift that you plan to use clashes with any advertisers. * Does covermount gift enhance the editorial values of the magazine. * What does publisher want to achieve through covermount gifting? Would your company benefit from a Covermount Gift promotion? Or would you use a Kuksa Cup? If so, feel free to contact us! Here at The ODM Group, we specialize in unique promotional products, as well as creating custom retail packaging and POS display units. Let us know what was the last Covermount Gift you saw and loved. You can check out a lot of gift with purchase covermount case studies and also let us know your favourites. Another example of a cool covermount promotion!